Cure the Queen of the blighted Gnisis Eggmine. Speak to Darius in Gnisis for orders. Obtain a spell or scroll of Cure Blight Disease on touch or target. Go to the Gnisis Eggmine. Return to Darius in Gnisis and report your findings. General Darius at Madach Tradehouse in Gnisis will ask you to cure the blighted Kwama Queen in the Gnisis Eggmine, located on the hill on the east side of town. You'll need a Cure Blight Disease on Touch/Target spell or a similar scroll (check with Hetman Abelmawia in town, though they are expensive) or you could also get the spell Vivec's Touch from the Shrine of Justice in town. Vivec's Touch is a spell that will cure any common or blight disease on touch. To learn the spell, you must go to the Tribunal Temple in Gnisis. The relic Vivec's Ashmask is there, but the one on display is a fake. 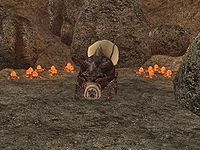 You must go up to the Shrine of Justice and pay tribute once, which will cure any common or blight diseases you may have, and then pay tribute again, which will open a hidden compartment in the shrine to reveal the authentic Vivec's Ashmask. Paying tribute requires a donation of a Cure Common Disease potion each time. These can be bought from the alchemist in the temple. Touch the Ashmask to be taught the spell Vivec's Touch. After procuring your preferred method of curing the Kwama Queen, just head up to the Eggmine. Follow the main tunnel to the Lower Eggmine. Be careful, as the Kwama Queen is guarded by several Kwama warriors. Return to Darius when the Queen is cured to collect 100 gold (and an increase in disposition around town). Although the Kwama Warriors will attack you, the Queen will not, and killing her will result in quest failure. If you cure the Kwama Queen before being assigned this mission, Darius will not recognize that you've done so right away. If you return to the Queen's chamber after being given the mission, however, you will receive the proper journal update upon entry. If you did not kill Lugrub gro-Ogdum in the previous quest, he will no longer attack you once you are assigned this quest. If you are not Imperial Legion and get into the mine (e.g., via the river back door), the Kwama Queen will not actually appear as blighted, despite all the "blighted mine" claims of the townsfolk, though there may be other blighted Kwama creatures in the mine (a random matter). If you kill the Kwama Queen, Darius' disposition is supposed to go down by 20, but since there are two dialog lines with the same requisites, it can never happen. Your journal may fail to update when you cast the Cure Blight spell on the Kwama Queen if you didn't discuss the outcome of the previous quest with Widow Vabdas when you received this quest. ? Return to the Widow and speak to her about the previous quest or donate to Darius' Widows Fund, then head back to the Eggmine and cure the Kwama Queen's blight sickness. The quest should now progress normally. Vivec's Touch and Rilm's Gift may not work sometimes. If this is the case try another Cure Blight spell or a scroll. ? 10 Darius asked me to cure the Kwama Queen in the Gnisis Eggmine. The Kwama Queen is blighted and the villagers suffer. 50 I cured the blighted Kwama Queen in the Gnisis Eggmine. 100 Finishes quest Darius thanked me for curing the Kwama Queen in the Gnisis Eggmine. 200 Finishes quest I told Darius that the Kwama Queen in the Gnisis Eggmine was dead. This page was last modified on 23 November 2018, at 06:35.